The gadget to answer our smartphone power problems is here - introducing Fuel the world's smallest phone charger. 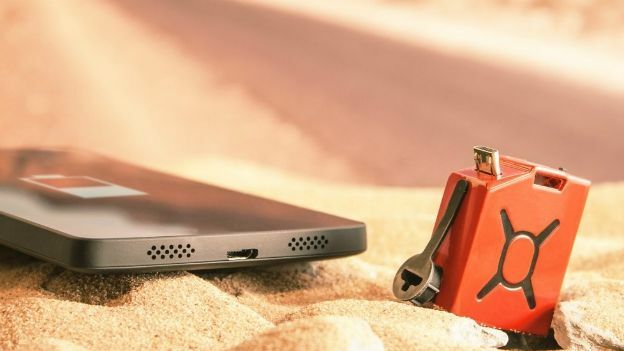 This mini jerry-can could be the savior to your poor smartphone battery with the capacity to provide enough power to last a 30-minute phone call. Firebox, a retail site for tech and gadgets, has recently listed the handy smartphone charger called Fuel. Measuring only 3.3cm x 2.3cm x 1.3cm it fits easily into your pocket for desperate times when you need more battery power. The tiny aluminum gadget features a micro-USB connector that fits into most Android smartphones including Samsung, LG, Sony, Motorola, Nokia and BlackBerry. Fuel can hold power for well over a month providing 20 to 30 minutes extra of talk time or a couple of hours standby time. A USB cable is also not included, even though the battery itself charges via USB so you'll have to purchase one separately. In addition, there's an on/off switch so you can reserve Fuel's power. Fuel is available now on the Firebox website for $41.59 (£25).